The Mission Board is very pleased to announce our partnership with Pastor Israel Jimah with Fresno Deliverance Church (FDC). Many of you may have had the opportunity to get to know Pastor Israel and members from FDC this past Sunday at the all-church Bar-B-Que. Pastor Cameron met Pastor Israel at the Clovis Pastor Ministerial Group and then solidified their friendship through the 21 days of fasting and prayer earlier this year where Pastor Israel and Pastor Cameron exchanged pulpits at each other’s church. Pastor Israel has an incredible heart for ministry. He shared with the mission board that he was saved from Islam by the Lord Jesus Christ in 1975 and then God called him into the ministry. With a missionary heart, God sent him to preach the gospel to many nations. He had the privilege of conducting massive evangelistic gospel crusades in Africa, seeing thousands of people respond positively to the gospel. Then the Lord sent Israel and his family to serve as missionaries in the Fresno/Clovis area where he now pastors Fresno Deliverance Church. 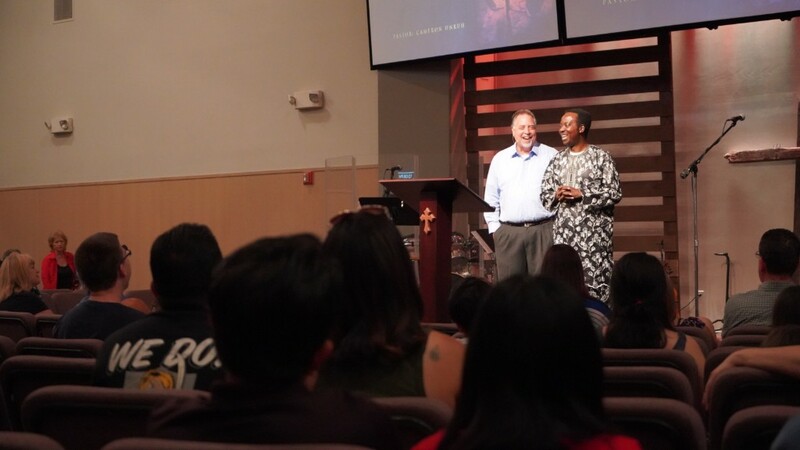 Not only does Pastor Israel pastor FDC, he also ministers the gospel to millions of souls in distant countries such as Liberia, Pakistan and beyond through their media ministry. The mission board encourages each of you to extend a hearty welcome to Pastor Israel Jimah and his family!